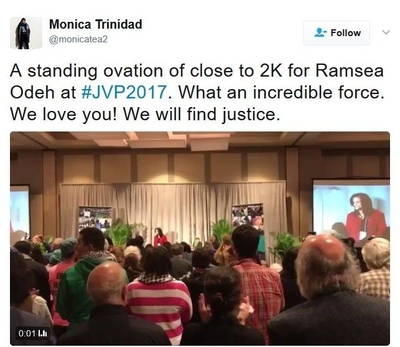 In what could be one of her last public appearances in the United States, convicted terrorist Rasmieh Odeh blamed her naturalization fraud prosecution on "law enforcement oppression." 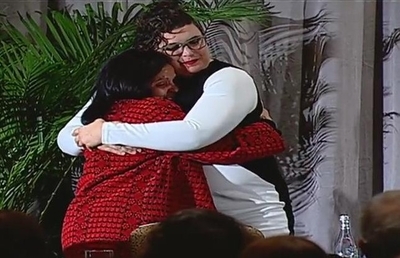 Odeh spoke Sunday afternoon to the Jewish Voice for Peace conference, receiving extended standing ovations and shouts of, "We love you, Rasmieh." Outside the conference, the pro-Israel group StandWithUs held a memorial service honoring the memories of Leon Kanner and Edward Joffe. The two Hebrew University students were killed in 1969 when a bomb went off inside a Jerusalem grocery store. Israeli investigators arrested Odeh, and later convicted her for the terrorist attack, after finding explosives matching those used in the grocery store and in a separate attack on the British consulate, in her bedroom. She also confessed within a day and identified other members of the Popular Front for the Liberation of Palestine (PFLP) terrorist group which was responsible for the bombings. Odeh failed to disclose that history or her PFLP membership when she came to the United States and later applied for naturalization as a citizen despite specific questions about any record of arrest, conviction or imprisonment. A jury in Detroit convicted Odeh in 2014 and sentenced her to 18 months in prison. 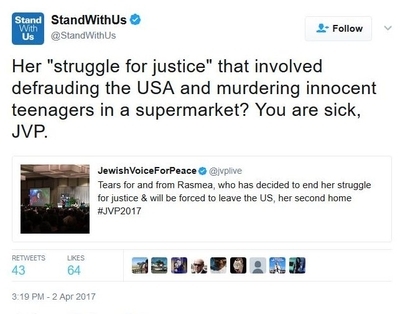 But she won a new trial after an appeals court ruled that testimony supporting Odeh's unsubstantiated claim that abuse she suffered in Israeli custody left her with post-traumatic stress brought – and that that somehow contributed to her false immigration answers – was improperly barred. That new trial was scheduled to start May 16. Last month, however, Odeh's attorneys announced that she will plead guilty in exchange for avoiding prison time. As a result, she will be stripped of her citizenship and deported relatively soon. "I survived another torturous ordeal because of all the incredible supporter (sic) people everywhere, [including] you," she said. During her 2014 trial, immigration officials were adamant that Odeh never would have been allowed into the United States had she been honest about her terrorist past. She therefore enjoyed a benefit, life in the United States for 20 years, which she never deserved. But to the JVP, Odeh is a victim, and she played that card heavily on Sunday. Palestinians and their allies in the United States "have had to face government repression because of our effective organizing for peace and justice," she said. She never mentioned her conviction, Kanner and Joffe's deaths, or the fact that she hid her past from U.S. immigration officials. Authorities always target "those who want to make a difference in the world," she said. "We are those people. We have to understand that we are targets, but also that we have the support of millions of others around the world who share our vision of historical Palestine liberation from Zionists where all Palestinian refugees can return to their original homes, and where everyone there can live with dignity and equal rights." Her dream of liberating "historical Palestine" from Zionists leaves no room for the state of Israel. That vision of a Zionist-free, Israel-free world was common during the weekend-long JVP conference. On Saturday, speakers cast Zionism as a form of white supremacism that fuels global injustice. "A world without Zionism is a world without oppression" would create "equality, dignity and human rights," said Lubnah Shomali of the Badil Resource Center for Palestinian Residency & Refugee Rights. Odeh, who fought back tears throughout her remarks, said she faces "a similar unjust Nakba [catastrophe]" as Palestinians faced in 1948, when Israel was created. "But I will continue my struggle for justice for my people where ever I land. I will continue the struggle for the right of return, for self-determination, and for the establishment of a democratic state on the entirety of the historic land of Palestine." The plea agreement has not been posted on the case docket as of Monday morning, so the only information available comes from Odeh and her legal team. It is not known what facts Odeh will agree to which prove her guilt, or whether the no-jail provision is guaranteed. If it is merely a recommendation the government and the defense are making to U.S. District Judge Gershwin A. Drain, he may want to see her take responsibility for her actions before agreeing to send her on her way. She certainly didn't deliver that Sunday afternoon in Chicago.